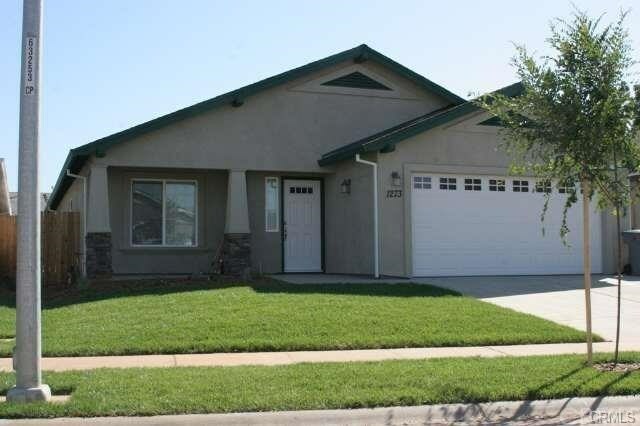 Conveniently located near shopping, schools and parks, this open and spacious home is ready for you! As you enter the home you will notice the high ceilings and the large kitchen with huge breakfast bar that opens to the living and dining areas. The flooring consists of hardwood laminate and carpet in the living areas and tile throughout the bathrooms. A split floor plan separates the master bedroom and the guest bedrooms giving occupants extra privacy. Both bathrooms were upgraded during the building process and feature tile showers with iron tubs. The sliding glass door in the living area brings in natural light from the covered patio with a hot tub that looks out to the well-maintained backyard. The backyard is the perfect size for pets, a play structure or garden areas. When the home was built, they added square footage to the garage making it extra deep for storage! The garage also has epoxy floors, a 220 volt outlet and a utility sink. Add a workbench and you have the perfect outdoor work space. A few other enmities include a whole house fan, Christmas light switches and a cement walkway on side yard that connects driveway to the back patio. Donât miss this great home!